The above shows Iranian oil production which has been dropping steadily through 2012 - until August. 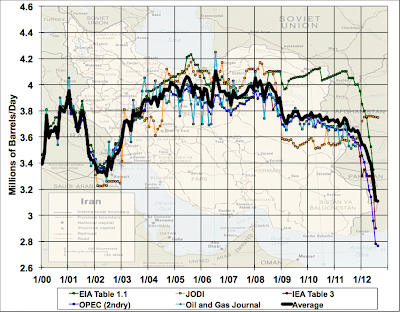 At this point, the evidence for that August stabilization is based solely on the "OPEC secondary sources" figures - I now largely discount Iranian self-reports. We will have to see what other sources say and what the next month or two brings. It's pretty important, since the Iranians' ability to resist sanctions will be a very different matter if their oil production can be forced steadily lower, versus being able to stabilize it (and then have their society slowly acclimate to the reduced revenues). My reading on recent events between Israel and Iran is as follows: I take the recent Netanyahu campaign of public pressure on the Obama administration as a sign of weakness. Private discussions must have broken down, and Netanyahu should realize there is no hope whatever of persuading Obama to support an attack on Iran before the election. So the fact that he's engaged in this kind of pressure either reflects poor judgement or an attempt to influence the election. Either way, it does not suggest an Israel that feels able to mount an effective bombing campaign on its own. It would not surprise me too much if Obama is willing to attack Iran after the election - he has shown himself quite willing to use force after sufficient consideration: so it's going to come down to whether he genuinely believes Iran having a bomb is intolerable. I do not know what he genuinely believes so we'll have to wait and see. If Romney wins (currently 30% odds on Intrade), I would see an attack as very likely. (Thinking about it - that's interesting and suggests that prospects for a Romney victory should influence oil prices upwards). Nuclear weapons and strategy are incredibly complicated and thus make nuclear warheads a favourite subject of populist fear mongers like both President Obama and presidential candidate Mitt Romney. Nuclear weapons are also rather impotent against non-state actors which I suspect continue to remain Israel's primary concern. Netanyahu must contend with an anaemic economy punished by the European crisis. Perhaps that explains the boldness? I doubt that Romney will attack Iran if elected. He risks putting the US back into recession if oil prices spike up and stay high long enough. Massive monetary stimulus by numerous central banks helps that outcome become much more likely.